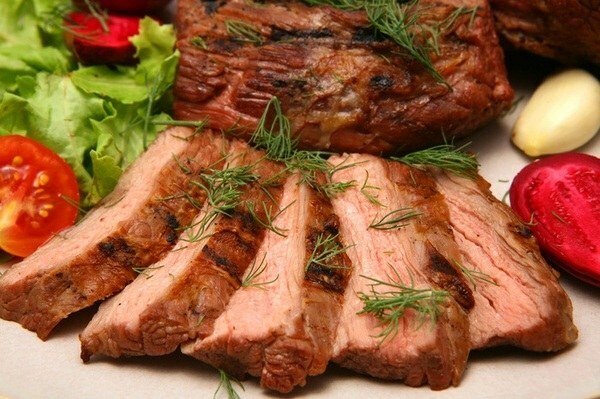 Juicy and flavorful meat you can cook in a special sleeve for roasting. Cooking in the sleeve combines the advantages of baking and roasting. Seasonings and other ingredients in the sleeve especially intensively impregnated with a main product. Dish when cooking in the sleeve it is impossible to dry, but crisp it is formed. Therefore, before the end of cooking should be trimmed sleeve top and return the product in the oven for a short roasting on an open fire. The meat should be washed in cold water and dry on a paper towel. Make a marinade. For this onion, you must peel and slice thin half-rings. Garlic peel and crush the flat part of the blade of a knife. Lemon cut into thin slices. In olive oil, pour 2-3 boats of cold water, add salt and pepper and beat well with a whisk. Then, continuing to whisk, add the remaining water. Add the marinade, lemon, Basil, allspice, Bay leaf, onion and garlic. Place the pork in the marinade, it should completely cover the meat. Marinate 12 hours in the refrigerator. Before cooking, tie the sleeve in one hand. Place the meat and pour a little of the marinade, and tie the other side. Place the sleeve in a baking dish. The ends of the sleeves are put under the meat to avoid contact with the walls of the oven. Bake at 180 degrees for 50 minutes. Then remove the dish and cut the sleeve. Then place the pork in the oven for another 15 minutes for formation of a ruddy crust. Increase the heat to 230 degrees. Cooked meat cool slightly and cut into portions. When cutting the sleeves, be careful not to get scalded with hot steam. 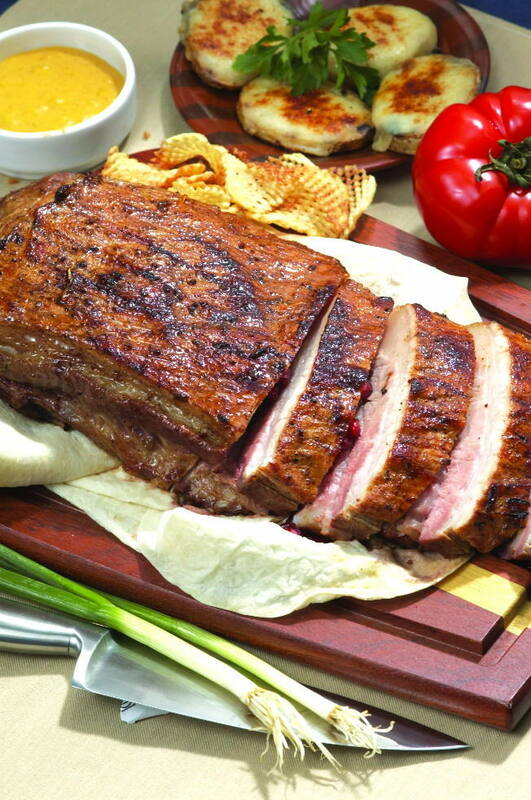 When buying meat, pay attention to its appearance and smell - good pork should be pale pink. Meat should be no any shades or spots. If you apply to fresh meat palm, it should remain practically dry. In addition, pay special attention to the fat, it needs to be milky white. The meat should not have an unpleasant smell. The meat in the sleeve you can add sliced potatoes and other vegetables. You get a wonderful, juicy and flavorful side dish. If you want to fully lean pork, don't bake until done without cutting the sleeve. When baking in the sleeve pork is cooked in its own juice. You have no need to add oil to the dish is not burnt. No need to waste time pouring on the piece of pork with the separated juice. 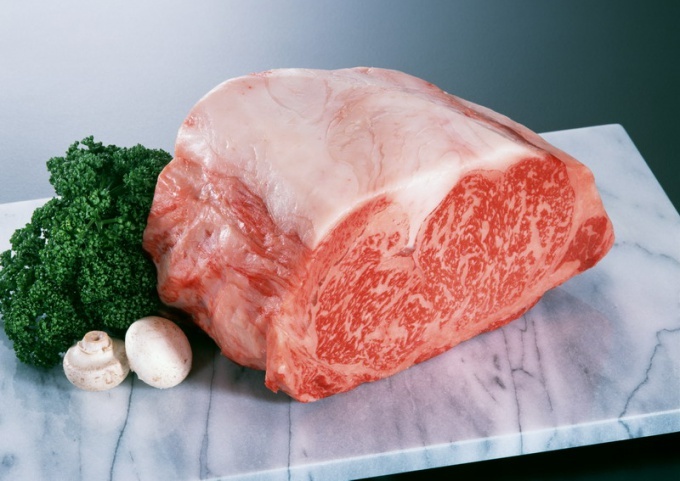 Excess fat from meat vytaplivaete, and the product obtained is almost diet. If you're a fan of fried crust, don't forget at the end of cooking to pierce the sleeve. Rinse the piece of pork with cold water. Dry it with a napkin or paper towel. Make a marinade. Mix in a bowl the soy sauce with honey. If honey is thick and poorly mixed, then gently reheat it in the microwave or on a gas hob. Peel a couple of cloves of garlic from the skins and push through the press to the marinade. The whole mass mix well. Cut into long wedges washed and peeled carrots. Make the piece of meat punctures thin knife blade. To puncture it easy to insert sticks of carrot, do it crosswise. Lard pork. Put the meat in p/e package. Pour cooked marinade. Of pack release the air and tie tightly. Now chat the pork in the marinade so it is evenly distributed on all sides of the piece. Place the bag with pork in a bowl and leave to marinate in the fridge. The marinating time from 20 minutes to days according to your desire. Peel the potatoes skin-on. Cut into slices. In this dish you can use whole small new potatoes. It is enough to wash under the tap with a brush to remove the remains of the earth. The skin scrape is not necessary. Onions cut into rings and separate them individually. Prepare a sleeve. Cut the required length from the roll. Zadejte clip with one hand. Cross a piece of pork with the marinade from the package into the sleeve. Let's pack the meat evenly with onion rings. Add the potatoes. Fasten the second end of the sleeve clasp. Place on a baking sheet and place in oven for 1 hour. Remove the dish from the oven. Make several punctures with a knife on top of the sleeve and again put in the oven for 15 minutes. Put the finished dish in a large flat dish and sprinkle with fresh herbs. If you are going to add a side dish in the sleeve before placing in the oven, marinate the meat directly in the sleeve. Preparing pork in the foil fairly quickly and easily, the meat turns out flavorful and tender, because all that excess fat from it vytaplivaete during baking. Using this recipe you 30-40 minutes time not only to bake pork but also make her an easy side dish of boiled potatoes. Rinse the meat under cold water and cut it into serving pieces. Cut each piece in 2-3 places, salt and pepper to taste. If you don't have pork neck, for baking you can use ham and shoulder. Wipe mushrooms with paper towel and remove each mushroom small lower part of the stalk, cut them in small pieces. Put the mushrooms into a deep Cup and pour ¼ of the pre-squeezed lemon juice. Peel two cloves of garlic and crush through a garlic press. Scald the tomato and gently peel it from the peel, use a knife to slice it into small cubes. Mix in a Cup of mushrooms, drizzled with lemon juice, crushed garlic cloves, the chopped tomatoes and mix thoroughly. Mix salt a pinch of salt and a little pepper. Heat a pan with 5-6 tablespoons of vegetable oil and lightly sauté in it the sliced pork. Put meat on foil, on top of him put the mushroom mix and wrap everything so that there are no open plots. 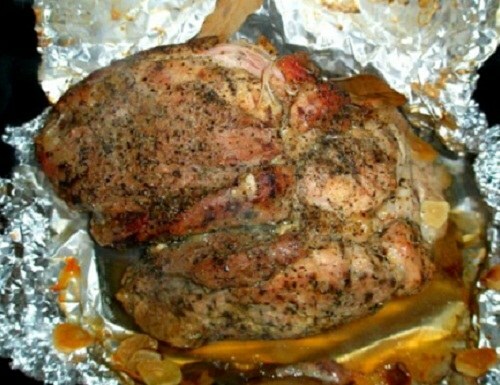 Pork with mushrooms place on a baking sheet and place in preheated 200 degree oven to bake for about 20-25 minutes. After the time remove the pan and carefully peel back the foil and pierce the meat with a thin knife. If you highlight a clear juice - the meat is cooked. Otherwise, put it in the oven for another 5-6 minutes. Serve baked in foil pork served hot on the table along with boiled or mashed potatoes, good meat will be combined with homemade pickles (e.g. pickled cucumbers and sauerkraut). 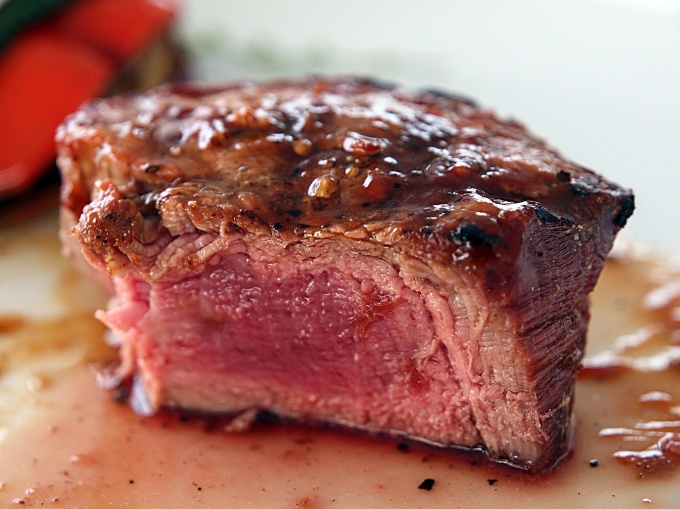 You can use baked so the meat and cold and after reheating in a skillet (it does not lose its flavor). Slightly sweet taste of pork, you'll be able to shade, by submitting to the table dry white wine.